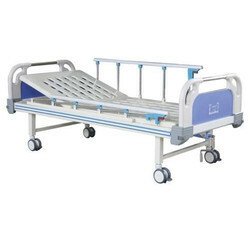 Our product range includes a wide range of full electric hospital bed, hospital bed, patient bed and hospital fowler bed. 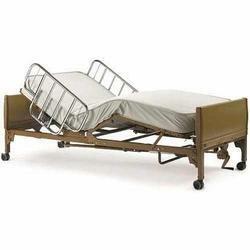 Mattress area divided into 4 sections made up of CRCA Sheet. 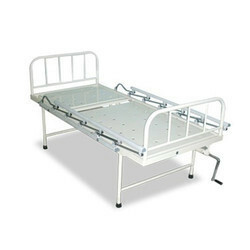 The bed is made on trolley base. 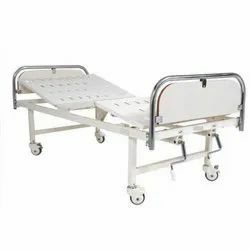 Food table is attached with bed to save the extra space. Provided with wooden dash board with metal box at foot bow. Detachable SS framed head and foot bows with laminated panels provide ease of access and a aesthetic look. Corner rubber / PU buffers absorb impact and reduce damage in handling. Saline stand provision on four locations. The complete metal components are pre treated and epoxy powder coated. 2 separate crank mechanisms for Back rest and Knee rest respectively.